Westbrook | Dish It Out! Time For Swine; “Sunil Or Later” WATCH NOW!!!! 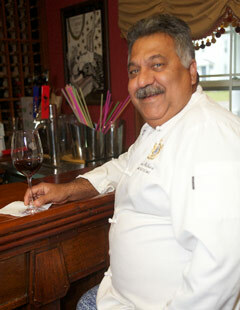 Master Chef, Sunil Malhotra of Creative Cooking in Westbrook CT aka Yankee Key West. I was his man servant. Actually I was his barman. The food was Cajun and Creole. It made the people’s heads turn and their feet too. Great food. We shared a slew of laughs, beers and GREAT FOOD. There was some debate that people came more to see me than eat his cooking. Spats: Sunie, you know that the people only come here to see me. Sunil: Spats, people don’t come here to laugh with you. They come here for a plate of bad food in saucy-sauce!! Granted this debate was mostly in my head. “Bad” as in “you just might lick your plate”. And “saucy” doesn’t begin to time with Sunil. People flocked to eat Sunil’s delicious cooking. This all went down at The Temple Of The Unusual. Sunil strung out the CT Shoreline 25 years ago with an intoxicating little spice rub on his cajun chicken grinder. My repartee told new diners that heroin was a key ingredient in the cajun season ing that made people come back again and again. I used it until some freak in New Jersey started doing that for real. I was learning to edit myself at the time, good times. Creative Cooking’s cajun chicken grinder is one of the best sandwiches you’ll ever have in your life time. I dare you. The Creative Cooking Cajun Seasoning is one of the most closely guarded recipe known to man. It’s a safe assumption that the only one knowing it besides Chef is his amazing wife, MB, but that’s not for certain. Sunil flat out won’t share the recipe. Flat out. It’s cool because getting recipes from people that leave out one or two key ingredients from prized dishes fries my bacon. This secret may go down in ‘Grassy knoll’ genre of mystery. Sunil’s balance of flavors is beyond me. He also has the right idea, “If they want it they can come down to the restaurant and buy it here.” Saucy sauce or what? In 25 years of having my first cajun chicken grinder I’ve dabbled in duplicating the spice rub. Not an easy processes, or inexpensive. I’ve burnt my mouth, nostrils and the kitchen wall. I’ve had red fingers for days. Patience in Process has brought Result. I’ve come to a great seasoning that stands on it’s own. The DIO Creole Seasoning (herein to be known as DCS) made Episode 8’s Jambalaya a Rockstar Dish. It was a key flavor component. We focused on layering flavors in this dish. It starts in our Lodge Cast Iron Dutch Oven, where Guest Sous (identity to be learned on Episode 8) browned some boneless chicken thighs. The chicken was coated in DCS. On to this tasty base went the andouille sausage. Then went in The Holy Trinity. On another burner we had our chicken stock working some magic (watch episode and learn the magic). As more veggies were plied and saucy sauces slathered the layering made sweet music to the nose. Music that moved Guest Sous to………….again, tune in and turn On. Came hungry did you? Better Life wanted? Look no further, DIO has you covered, with our DCS!!!!! This is a rub to make you go “a dub a dub dub”. It will rub you the right way. Add more jokes here. Go mix some up and make your Pantry ‘pplaude! You’ll be awfully glad you did. Dish some out for yourselves! Soooooo goood. And for those interested in differences between Creole and Cajun cooking, there are many. Salad Days! Tomatillo Salsa Recipe! A couple lifetimes and botox appointments ago, I was a gardener. I did it for the gladiolus, not as a source of income. Situated in sleepy Westbrook, CT (Yankee Key West) There was this little cottage by the sea with knotty pine. I lived there with Sista Sal in my, ha- ha, salad days. I was an ideal tenant with christmas flaire and a penchant for landscaping. The seasons were (ivy) covered in great style. My gardening included maintaining containers, bulb planting, vegetables, herbs, annuals and perennials. I had this mad idea that the lawn should be covered in daffodils every spring. Each year the lawn got a little closer to Holland. It was great recreation to bring color and produce to our table. Every year the “Perenial Love Garden” running the length of the property was introduced to new and inspired cast members. Hosta, bleeding hearts, anemone, phlox, allium; we had them all. One magical day friend Robin asked if I wanted some bamboo. Sharing ‘starts’ of new plants is common practice in Yankee Key West. She brought me a couple innocent looking pots. The Garden was going to look so cool. 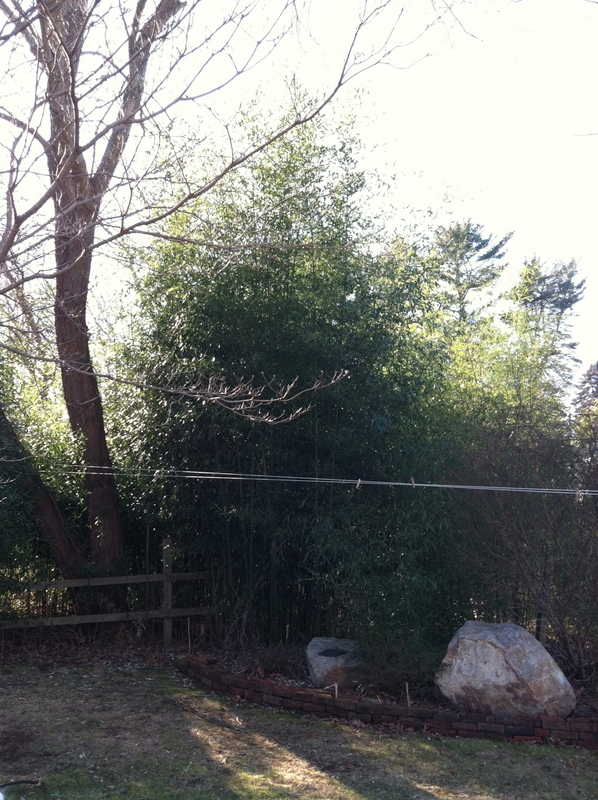 The bamboo turned out to be a last straw (as it were). I didn’t realize it was so virile. So agro. Bamboo spreads like a, well, like a bad idea in your early twenties. And it popped up everywhere. The Love Garden, the lawn, the adjacent driveway. The second season it made it’s way into the neighbors yard who assumed it was free white asparagus and served it with lamb one night. 86 the bamboo from the Perennial Love Garden Sista Sal asked. DIO READERS: I moved it to the far corner of my folks yard, thinking the shade would keep it dwarfish. It’s proximity to the marsh brought it a new life. Here’s a pic from a recent visit. Twelve years later it looks like a location shot for “Crouching Tiger, Sleeping Dragon”. I would continue to experiment in my Garden Of Good and Evil. I had a corn period, fail. I got fascinated with castor bean plants, also known as mamones. They were freaky leaved tropicals that grew wicked gnarly (remember, it’s New England) flower buds resembling blackberries. We had to say “No to Mamones”. Mile high sunflowers and morning glories were a triumph. I planted broken down fish remnants in the steps of our New England forefathers as an amazing fertilizer. My garden beds came to be the stuff of Johnny Appleseed legends. They could turn it out. Now I told you that story to tell you this one. Every year the veggie garden got a little bigger, a little more daring. There would always be a featured guest star for each growing season. After Habanero-Hot Summer circa 1977 I thought to cool it down with planting tomatillos. Tomatillos are little fruit popular in mexican cooking. plant with care and get ready to eat. Tomatillos grow in this charming little husk that splits open as the fruit ripens. The husks resemble chinese lanterns that I thought would match the bleeding hearts and bamboo in nearby garden beds. They produce a lot of fruit in charming little lanterns. So much so that at you can’t keep up with them as they ripen. So they may have fallen into the soil and rotten. There was so much fruit. I didn’t even think it would matter. Until the next year. I had moved to new digs a mile away but retained liberal visitation with the Gardens. Sista Sal calls me to come over and see the fruits of my labors. All that fruit seeded the veggie garden, now in her care. Tomatillo plants were popping up all over her well appointed vegetable garden. Bamboo Redux! Almost overnight they spread like crazy. For the remainder of the growing season, there were tomatillos for everyone. Sista Sal, the neighbors, friend Robin, Uno and Due all got there fill of the tasty fruit popular in Mexican cooking. We’d leave them on doorsteps with notes saying “Freshly grown, not to be thrown”. We had to get up on what to do with this bounty, actually I had to get up on what to do with it as Sista Sal had organized a mutiny on the bounty. I had left the garden beds better than I had found them and my fruit needed to be dealt with. I pickled tomatillos. I fried tomatillos. I baked tomatillos. I made beautiful sauces for enchiladas. 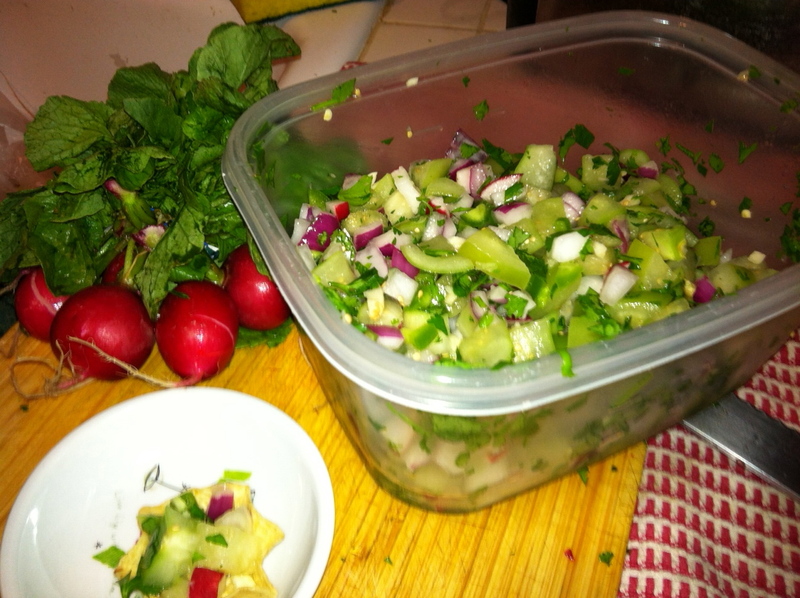 My most successful recipe for the tomatillos was for salsa. People seemed to eat it up. It was easy to assemble and always thought of as a nice gift and not “here comes Tony again with his GD tomatillos”. I thought you might like to give this a try for your summer snacking. What to do with all that bounty? Salsa lessons. When you take your first taste please think of a tiny cottage surrounded by little flowers and a madman burying fish carcasses in the backyard. You’ll understand what Sista Sal got to live with and some very special summers. We love us some sandwiches. Give us two (or more) pieces of bread and a couple items in between and the happy dance will commence. On the run, on the lawn or after a major holiday they have mass appeal and by that we mean that church services can make you think of sandwiches. Mass appeal. We digress. The joy of the sandwich is that you get to eat with your hands and it’s okay. It’s revered. Lift and chew, ahhhh the simplicity of it all. We will eat them for breakfast, brunch, lunch, dinner or midnight snack. Dessert is not out of the question either, hello ice cream. They are compact, filling and inspirational. The refrigerator becomes your palate and the bread your canvas. And may we say right here that your palate is very becoming. (Sorry, couldn’t resist that one. )Your ingredients have the possibility of achieving masterpiece status. 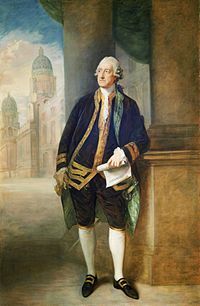 We send thanks to that famous Earl that is credited with coining the term. Bread meet meat. Meat meet bread. His reasoning in ordering it was that he wanted to keep his hands clean while playing cards. We can dig that. And hero is a type of sandwich. in our hearts and often on our minds, the sandwich has so many wonderful little variations and names too. There are submarines, pockets, hoagies, and grinders. 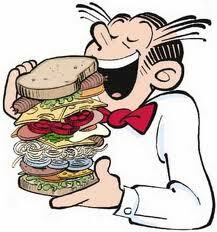 The Dagwood, the Club, the Melt and the Hero. We wrap, we open-face, we dip our bread and stuff our little faces. Po’ Boy is one such alias. From Louisiana like so many of our favorite things (Cajun and Creole cooking, zydeco music, Chef John Besh) the Po’ Boy serves up sandwich joy in many varieties of fish, meats and veggies. It’s history stems from a store owner feeding local street car operators during a strike. The workers were considered poor boys for the situation, and the cajun dialect edited the name. It’s the Big Easy y’all, laissez bon temps rouler. The great gumbo/melting pot that makes New Orleans special allowed many different cuisines to spin the Po’ Boy. 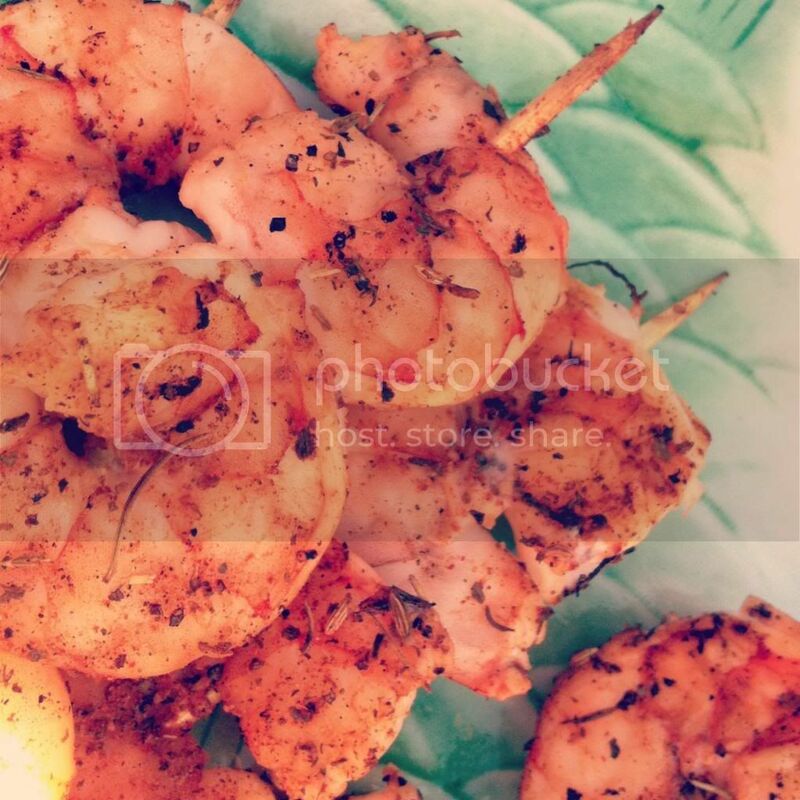 Cajun shrimp, southern fried catfish and the tasty muffalata are great examples of heritage cooking showcased as easy as slicing bread. 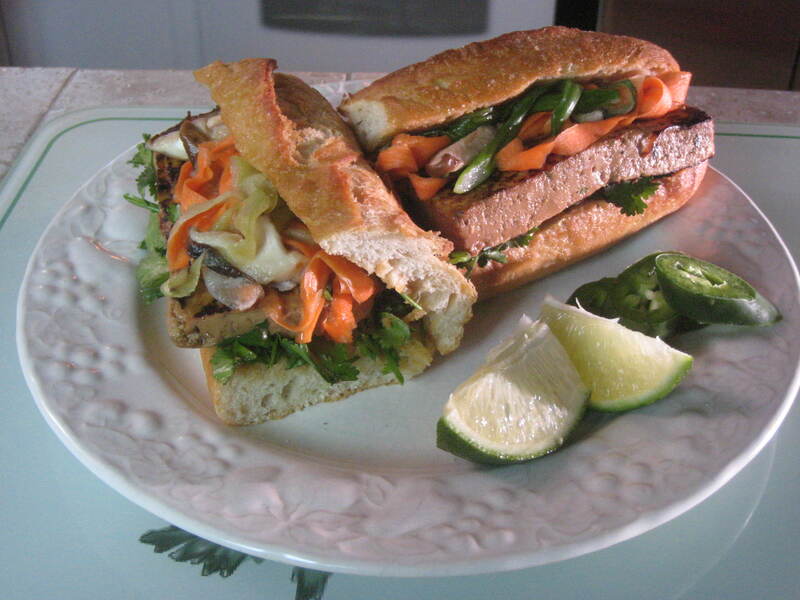 The Vietnamese entry is called Banh Mi. Again, great bread keeps it all together. Open a baguette and add a center protein, usually barbecue’d then jazz it all up with pickled vegetables, jalapenos, cilantro and lime. They had us at Ba-. We’ve been accused of obsessing. When a recipe grabs us we become their slave. We’ll eat it many many many times over. We will stalk the ingredients down to fill our pantry in case we need to improvise in the middle of the night. We will buy multiples and not blink. Walt’s Market on Main Street in Old Saybrook CT has an Italian Combo grinder that became a monday tradition before work. Mind you the market was two towns past where work was, but that didn’t matter when we made our way to checkout then to work. In Santa Monica CA all you need say is Godmother and Bay Cities Deli and people nod their heads reverently. We have mentioned the Cajun Chicken Grinder of Creative Cooking in Westbrook CT. “The Temple Of The Unusual” ‘s owner Master Chef Sunil Malhotra enslaved the Yankees of sleepy little CT Shoreline town with his cajun seasoning. People would return two and three times a week to get their fix fill of tasty tasty saucy sauce. And now in accordance with the prophecy, sorry wrong tangent there. Bewiched our latest banh mi-bsession has gained accomplices. Dear Sista Sally is made to pick up what’s arguably the best Banh Mi in the country from a little market in Philadelphia. She then must drive it to CT or mail it to Los Angeles. It doesn’t matter if it’s eaten the next day, this sandwich RULES. The most popular one they offer is with a marinated tofu so good you’ll lick the paper it was wrapped in. Marinated tofu, pickled veg, cilantro, lime and chilis. Bring to me now. You know the drill babies, Come hungry and get ready to taste a better life because we’re……gonna Dish It Out!